Really. It is OK not to have rooms full of books. I know I keep coming back to this. Which I suppose means I’ve not solved the problem, once and for all. 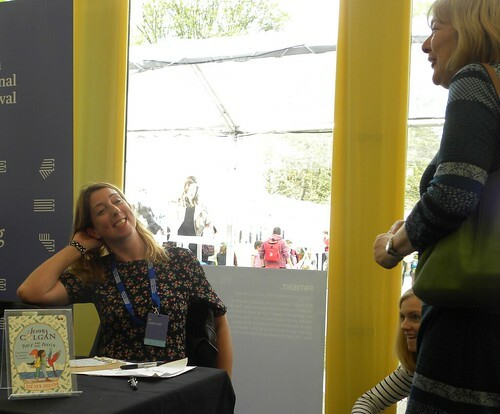 But I had a bit of an epiphany at the Edinburgh Book Festival in August. 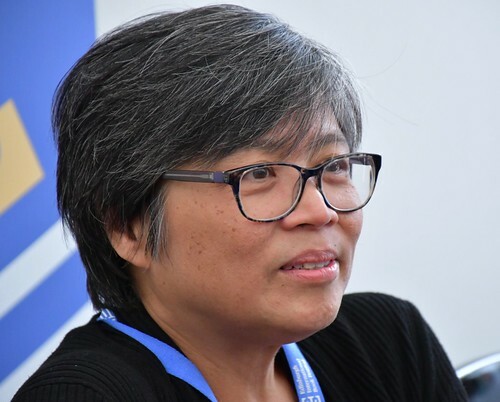 Three authors – Candy Gourlay, Lari Don and Elizabeth Wein – talked about their early years. And someone, maybe all of them, mentioned not having had many books as children. Going to the library for something to read. And of course, it was the same for me. Until the age of about 15, when it suddenly dawned on me that as an almost adult, I could save my pocket money and actually buy books. So I did. I know it might sound odd. But books in Sweden were expensive and mostly things adults gave you – a few of – for birthdays and Christmases. Not something you bought yourself. I read so much. I went to the library. I was happy with what they had to offer, and didn’t mind handing books back after three weeks. Or four. I didn’t mind that on my own shelves I had maybe a metre or two of books belonging to me. There was no prestige involved. Whereas now, well, not only do I want to own the books I like best, and that I’ll want to read again, but I feel the need to show off a little, as well as having a selection of books in case someone comes to stay who wants to read. The more I think of this, the more idiotic it sounds. I need help. Someone to climb up to the back row of the top shelf (that’s the As and the Ns), so I can start being ruthless. Perhaps. (Almost) every time I walk past the spot at Edinburgh Waverley station where Menzies used to be, I bless the day when I discovered you could buy Alistair McLean paperbacks there for 30 pence. Even though this was in 1973, it felt impossibly cheap to me, a young witch who knew books cost a fortune. It really was, and from then on, my luggage always contained at least twenty new paperbacks each time I left the country. I’d simply had no idea. And with a start like that, it’s hardly surprising I now have a habit that has to be broken. Not the reading, but the owning. Some events simply want to go on for longer. Or, failing that, to come back and continue. 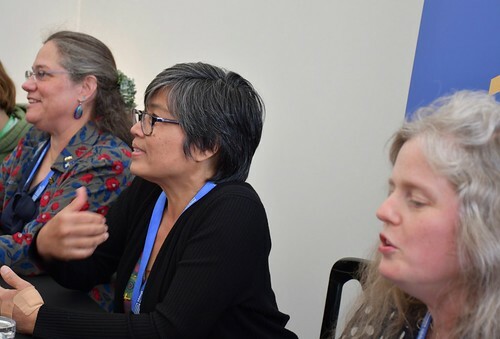 The SCBWI discussion on freedom to read and to write, with Lari Don, Candy Gourlay and Elizabeth Wein, was one such event. There was so much to talk about, and with three women with lots to say, an hour was not enough. But that’s my only complaint! Very ably chaired by Elizabeth Frattaroli and Justin Davies, we all enjoyed it from beginning to end. 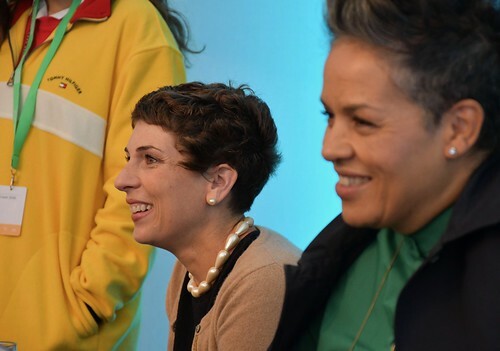 Despite feeling I know these three authors well, I had not stopped to consider what very different reading backgrounds they have, growing up in three countries well apart from each other. 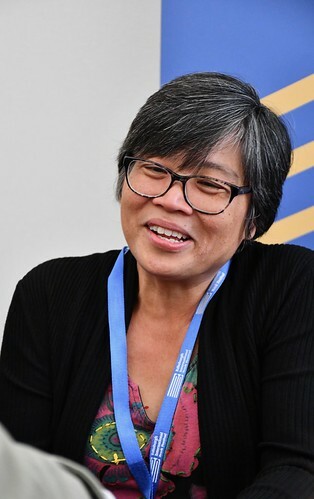 Candy grew up in Manila where she did have access to a school library, but there were no public libraries at all in the Philippines. She began alphabetically, but got stuck on B for Blyton, fascinated by the different world discovered in those books. But she never found any brown children in them, and deduced that maybe Filipinos weren’t allowed in books. There was one, The Five Chinese Brothers, which as an adult she has discovered to be very racist. Lari was ‘not exotic’ at all, she said, growing up in Dufftown. And while her family and relatives lived in houses full of books, there were no Scottish books. She read Nancy Drew, The Hardy Boys, Narnia. Her favourite was Power of Three by Diana Wynne Jones. There weren’t YA books in those days, and most of the books Lari read were about boys. Not about girls, and not set in Scotland. Candy described coming to Britain, with all its wonderful libraries. And now they are being closed!! There were no publishers in the Philippines back then, but today there is a vibrant publishing scene. And there are some libraries. Her own problem is with rights, as US publishing rights include the Philippines, which makes the books too expensive. She has to negotiate a deal to make her own books affordable in her own country. Reading from her new book, Bone Talk, Candy did so on her mobile phone. (She apologised.) After listening to her read the wild boar incident, I want to listen to Candy reading the whole book. It became something completely different when she read it. 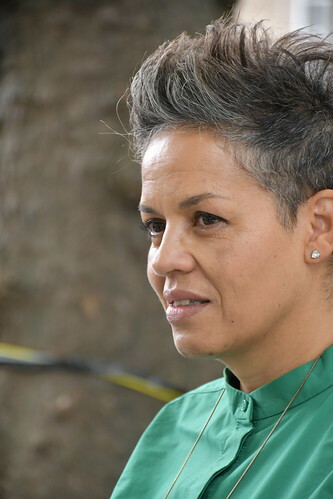 Lari likes mixing different cultural ideas in her writing, but she’s now wary of cultural appropriation, and no longer feels sure she’s allowed to write about culture belonging to others, and definitely feels you can’t touch Maori or Aboriginal stories. You have to be sensitive. 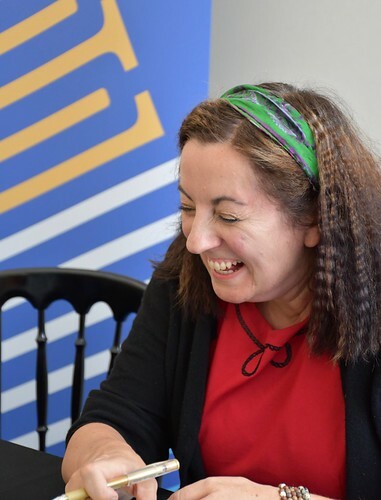 Elizabeth spoke about the freedom she felt writing for Barrington Stoke. It’s not harder. You just write short, like a novella, and then there is the editing, which helps make these dyslexia friendly books easy to read. So for instance, in Firebird, they chose another spelling of Tsar – Czar – because the first one is easily confused with star. And even if you’re not dyslexic, short is always good. 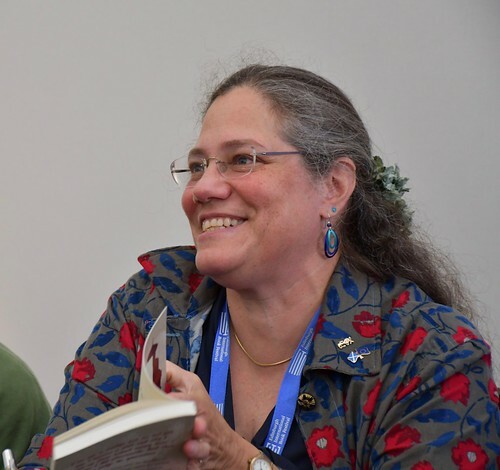 For freedom to read, Lari suggested letting children choose what to read, or even not to read. It’s interesting to see how all three authors had so many thoughts and ideas on all this that they – almost – fought to speak. When it was Elizabeth’s turn to read she chose three, very short pieces. 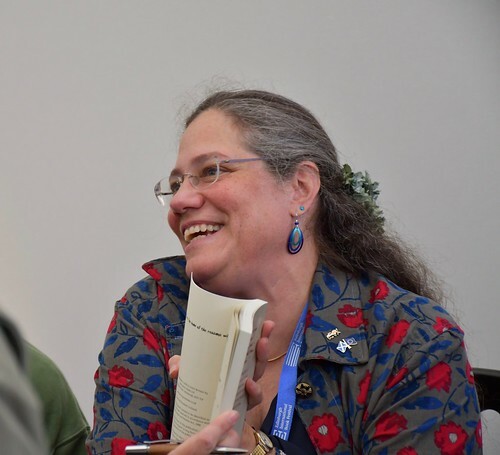 First there was freedom in Code Name Verity, then some lines from her favourite Ursula le Guin, and finally the freedom on what to do with your hair and make-up in Firebird. As for their own freedom, now that they are successful authors, there is a lot less of it. 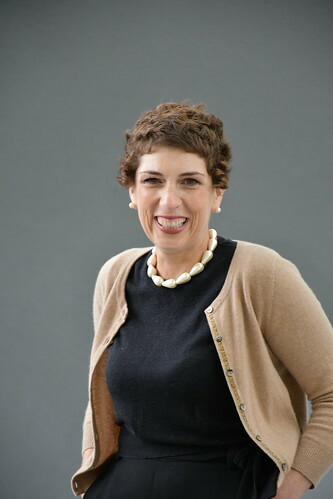 Elizabeth believes in discipline, being interested in what you write and to start small. Candy uses a forest app on her phone, where during 20 minutes a tree grows, and she is unable to access the phone for anything else. So she writes. And she doesn’t do homework for fans who write to her. 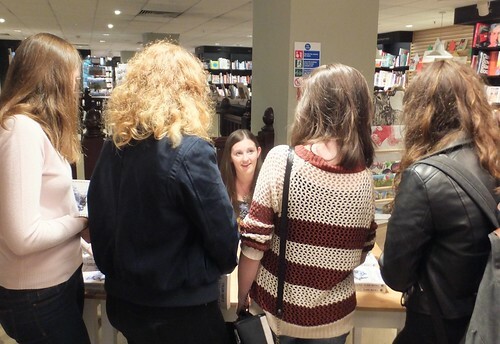 There was barely time for questions from the audience, but they were all able to ask lots of questions during the book signing afterwards. It took time, but everyone left satisfied, and before the next event was ready to move in. 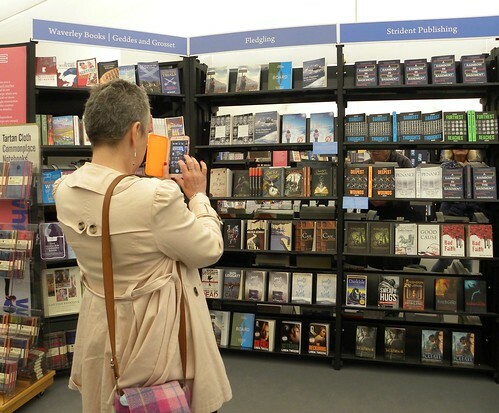 The bookfest should ask these authors back to continue where they left off. Our second book festival Saturday was mostly spent chatting to author friends we’d made earlier. And that’s a very nice thing; this meeting up with people who’ve all come to the same place. It’s also a rather bad pun to indicate that the first event yesterday morning was chaired by Janet Ellis. I got slightly more excited by this than my Photographer, until I did my maths and realised she’s too young for Janet’s time on Blue Peter. But us oldies enjoyed the BP-ness of it. Once my eyes had opened a little more, I saw Alex Nye arriving for her event chairing A L Kennedy. And when we were back by the yurts after the first event, we watched A L being given the Chris Close treatment, although I think she might actually have given Chris the A L Kennedy treatment. She had her own ideas of what to do, like covering her face with a mask. 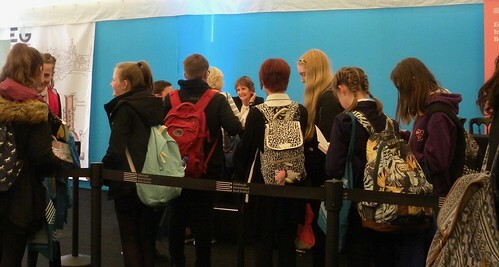 We also hung in the signing tent while Jo and Kit did their thing, meeting young miss Nadin for the first time, and after that they were ushered out to the photocall area, which brought back fond memories for Jo. And us. Sent the Photographer over to catch perennial weekend morning favourite Andy Stanton and his long signing queue. It’s nice with traditions. While getting ready to cross to George Street, we spied Barry Hutchison coming away from his morning event, and I could have sworn that was Chae Strathie who turned up as well. Barry came over for a hug. Two hugs, really, but that was before my Photographer mentioned the squirrels. We were treated to an impromptu show about a banana drink and a piece of popcorn in the wrong place (Barry’s throat; the wrong part of it) before he was called on to drive his family home. There was a queue for the SCBWI event with Lari Don, Candy Gourlay and Elizabeth Wein, but it was all right. We got in and we got seats. Finally met Barbara Henderson in person, a split second after I worked out that’s who she was, and mere hours after talking about her book at home. Chatted to a charming **illustrator, whose name I forgot immediately, and her charming son, who will go far. Caught a glimpse of Donna Moore and then Photographer and I disagreed on whether we saw Jenny Brown or not. But it was definitely Yanis Varoufakis outside. When there were more SCBWIs round the tea table than you could shake a stick at*, we decided we needed to run for the train we had picked as reasonably safe from too many Runrig fans heading to Stirling. Seems most of the 20 000 or so had not chosen our train. Just as well. *There is obviously no such thing. I have plenty of sticks. 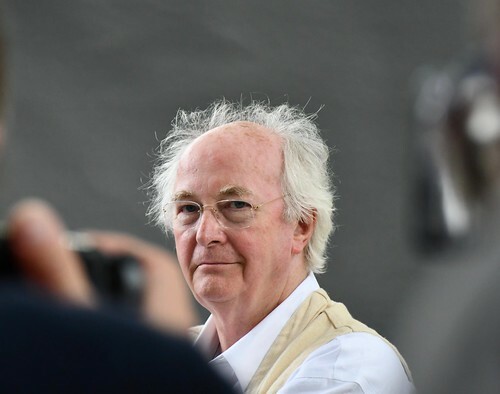 Philip Pullman and I talked about the weather, which was Goldilocks-like. Not too hot and not too cold. Not wet. Nor sunny. 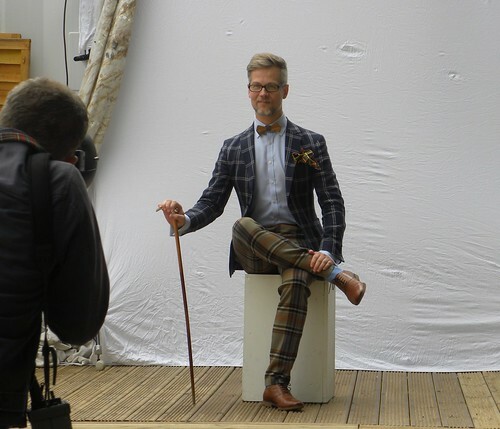 It felt very British, on this the first day of the book festival in Edinburgh’s Charlotte Square. It’s a new, streamlined square. Less higgledy piggledy, although no doubt more ‘character’ will find its way onto the fresh decking before long. I offered them my sandwich wrapping, but it seems they didn’t feel the need for it. I now know how they were able to make the Main theatre bigger. They picked up a whole theatre and put it in the middle of George Street. Very clever. The Photographer and I arrived early and had a leisurely start, collecting tickets and getting to grips with all the changes, saying hello to press boss Frances, and gossiping with Theresa Breslin’s Mr B – whose t-shirt sported Mary Queen of Scots on the front and Rasputin’s dagger ‘in’ the back, so he had everything covered. 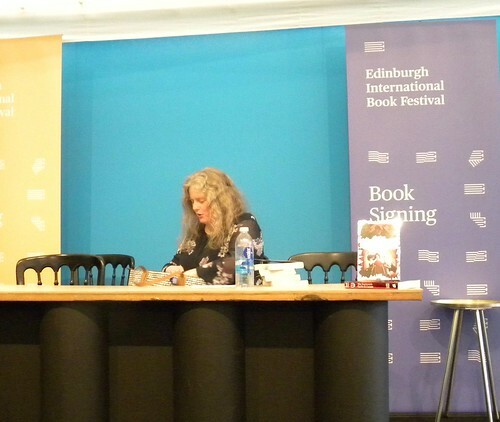 Waved to Cathy Cassidy (wearing an unexpected red…), before venturing across to George Street to watch her signing in the much improved signing tent. 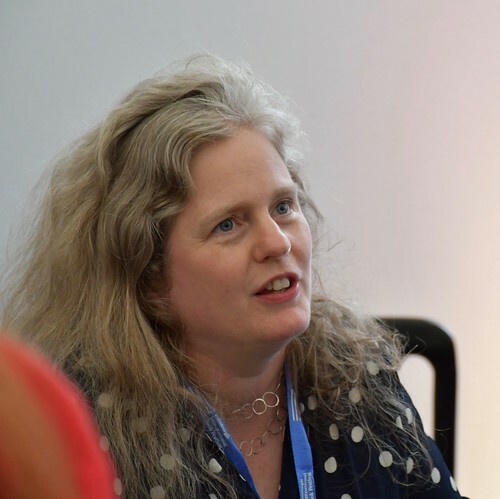 After noting that the festival regular with the magnificent beard was there again, we went to Theresa Breslin’s event with Holly Webb, chaired by Daniel Hahn. It was really full, despite Theresa’s grandchild choosing to go to see Terry Deary instead. Chatted to Kate Leiper in the bookshop afterwards, and then went back to the behind-the-scenes decking where we found Philip Pullman with a pile of [his] books. 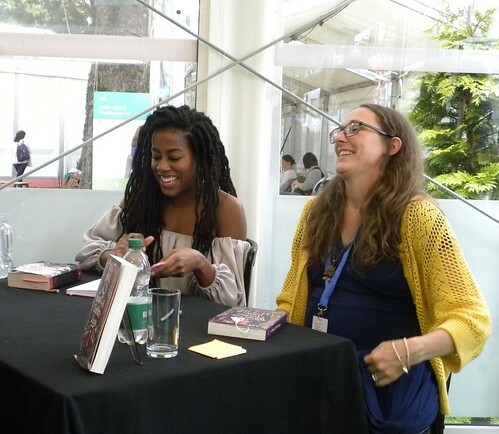 Had a second go at chatting to Cathy Cassidy, and watched as Chris Close photographed an unknown, attractive female author who, when I got to my next event, turned out to be Tomi Adeyemi, appearing with Sophie Anderson. 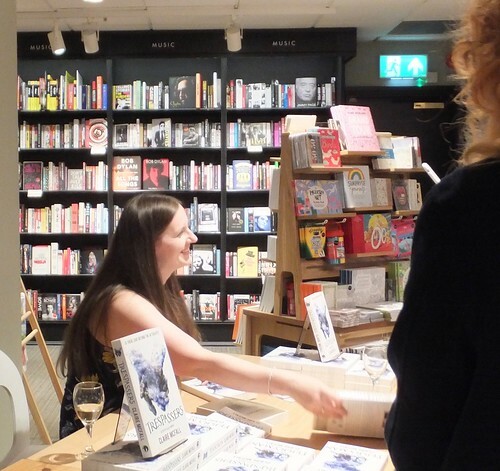 This was another full event, and I realised that having left the Photographer to deal with Philip, I was on my own and needed to take pictures of Sophie and Tomi in the bookshop. I’m short, so was able to use the entrance for hobbits and munchkins. Saw Vikki Gemmell and wanted to say hello, but she ran away. Quite understandable. There is a blur after that, but I definitely saw Linda Strachan and Lari Don, Gill Arbuthnott, Kathryn Ross, and Carol Ann Duffy. 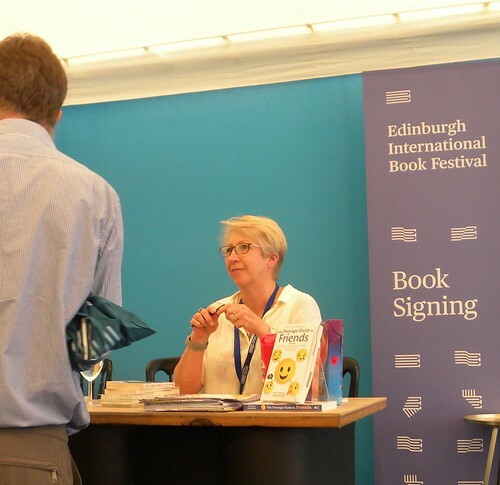 Val McDermid was around, as Philip Pullman’s chair. 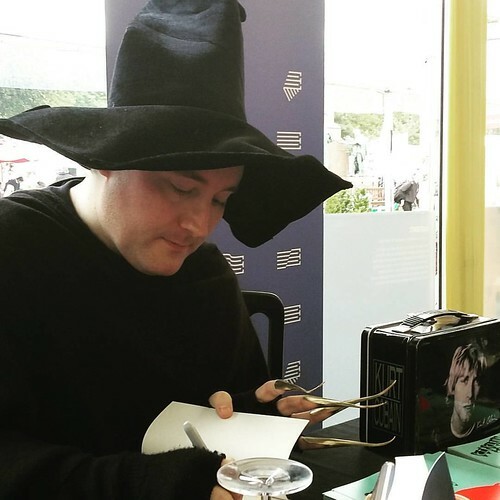 Someone came up to me and asked if I was Bookwitch, so I had to admit I was. Seems our paths have kept crossing, and now she wanted to say hello. L J MacWhirter found me mid-prawn sandwich, and I had no idea that this would scare her off so fast. Didn’t mean to, L J! And while I was enjoying those prawns I watched as Chris Close commented on Jacek Dehnel’s outfit – it was very, erm, chequered – before persuading him to pose. 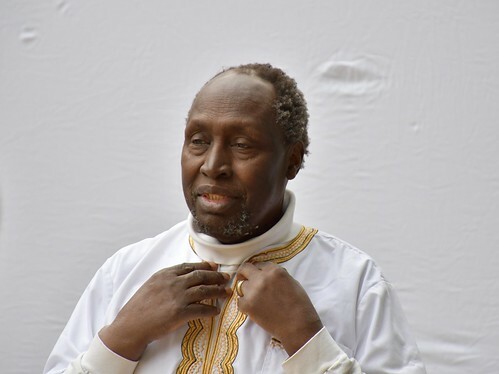 Ngūgī wa Thiong’o was being interviewed nearby, before also getting the Close photo treatment, and director Barley himself brought some more tartan for this venerable author. 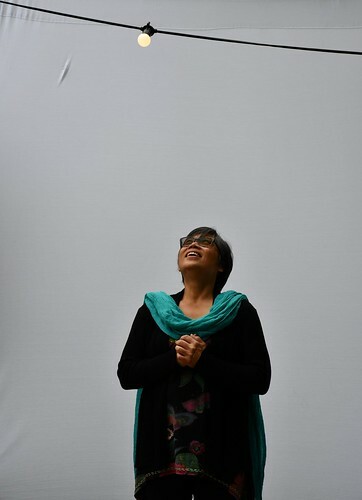 My Photographer returned when Philip Pullman’s sold-out event came to an end, and we gathered ourselves and went in search of a train home, hoping that seven was both early enough and late enough and would mean there was room for two tired witches. There was. Just. 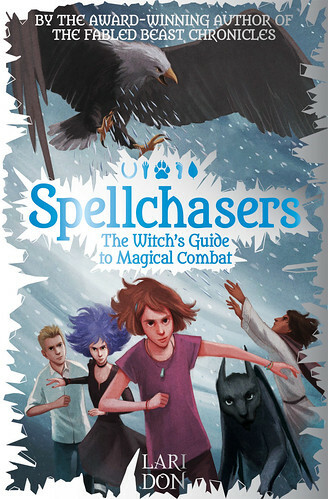 I know that her Spellchasers trilogy – of which The Witch’s Guide to Magical Combat is the last book – is really for fairly young readers. But there is certainly no talking down at them, and I have to say that I enjoyed this. Even ignoring the fact that I obviously can’t pass by such a witchy title. From the first book about Molly, who turns into a hare when she hears a dog bark, I felt the characters could easily be older than the 11 or 12 I believe they are meant to be. And that’s because these children are mature, and the language is older than you sometimes get for this age group. Which is good, because it will help the readers grow and learn, while having fun. Molly can now become almost any animal, and not only by hearing barking, so she needs to learn to control that magic. But they have all lost some control of their powers, or they have too much. Theo might kill off the whole neighbour-hood, and Innes really shouldn’t quarrel with his dad, and whatever happened to Atacama, who seems to be asleep? Beth is feeling extra protective of her trees, and the old witch has ‘lost’ her powers. So not everything is as it was. That I can identify with. I’m not surprised that Lari has some pretty eager fans. 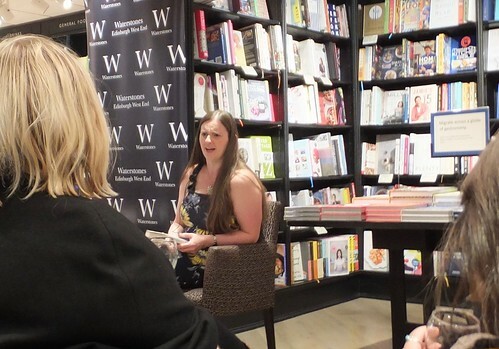 She had a launch for her third book last night, and I remember the fans at the launch for the first book only five months ago. Who could resist such fun, not to mention a book with such a shiny cover that it lights up the whole room? 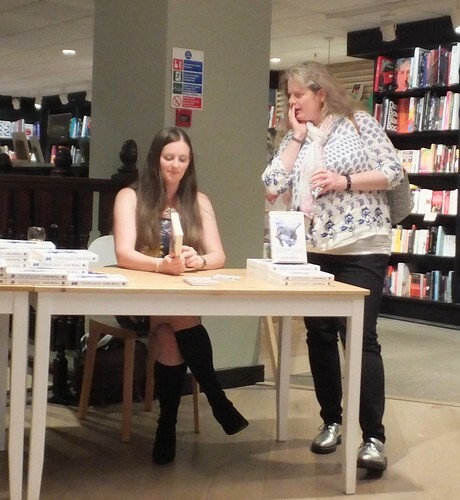 No sooner had I met Claire McFall last Saturday than she invited me to her book launch, which was last night at Waterstones. So back to Edinburgh I went. This was no hardship, as I’d had several days of ‘rest.’ And I was able to meet up with two toddlers on the same day, both of whom took exception to their mums being a bit busy with other people. The second toddler belonged to Claire and he was a little vocal about mum sitting over there on the chair, without him. 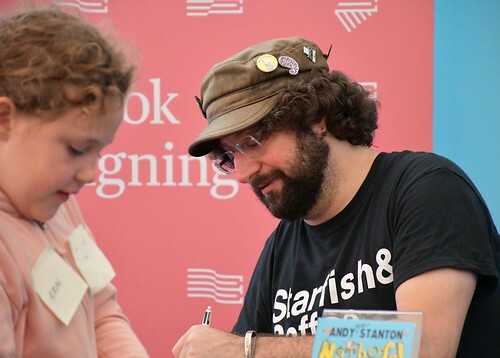 I thought that was rather lovely, and realised that there are too few tiny children helping launch their parent’s books. I had already encountered several spoilers re the end of Ferryman, so coped relatively well with Claire’s reading from Trespassers. It sounds at least as good as the first book, so those Chinese fans are in for a treat. As are the – slightly fewer – Scottish fans. Some of them are Claire’s students at school, and they were there last night. Lots of photos were taken, including some great ones by Claire’s mother, which I had to go and ruin by suggesting maybe the book shouldn’t be held upside-down. I won’t be invited again. Here’s to another million sales! Thanks to me wanting a scone (although it turned out not to taste terribly nice) I found Moira Mcpartlin downing an espresso at the station café, which was very nice indeed. We were both going to Edinburgh, so suddenly I had company, which was both welcome, and positively useful, as Moira kept me awake. And there was all that delicious book and author gossip to engage in. In Charlotte Square the first thing Moira needed to do was photograph her own book (Wants of the Silent) in the bookshops. Which is a perfectly normal thing to do. Then we went over to admire [the photo of] Kathryn Evans in her swirly dress, and as we stood there a black clad figure wearing an enormous witch’s hat walked past and into the Corner theatre. An hour or two later I discovered this had been Kirkland Ciccone. It being a really warm and humid day, he said he’d been too hot, except when you’re as cool as he is, you can’t be too hot. So that’s fine. 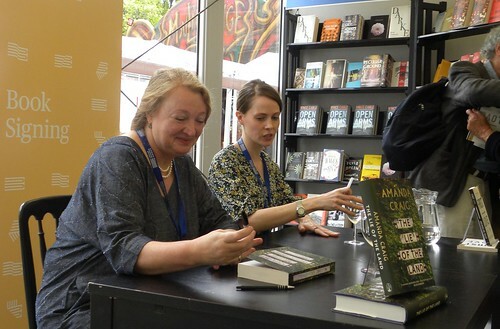 The first thing for me was to find Amanda Craig who was signing after a morning event in the Spiegeltent with Gwendoline Riley. 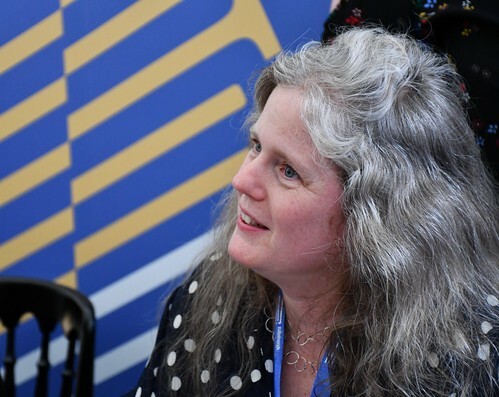 Amanda told me it had been a good event, and how much she enjoys the book festival. I rested in the yurt for a bit, and was able to hear all the shouting going on in the tent next door where Lari Don was entertaining a large horde of schoolchildren. 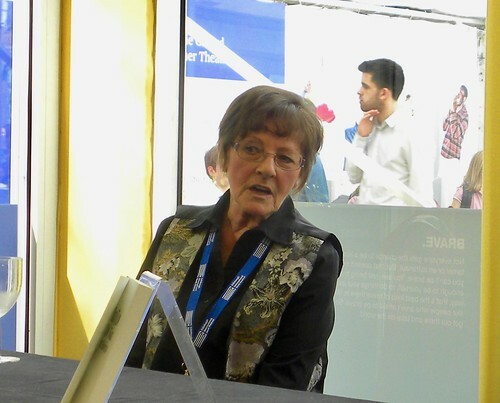 Caught her just before her signing, when she was having a one minute rest. 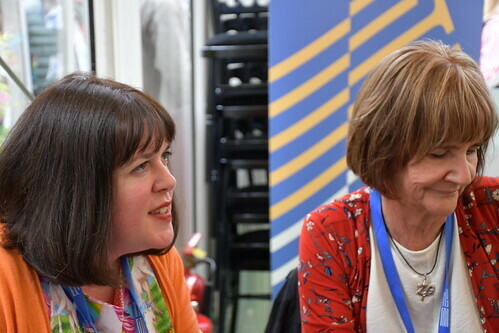 My main reason for day 6 was to join Theresa Breslin’s school event (they said I could), so Frances kindly walked me over there and told them it was all right for me to sit in. 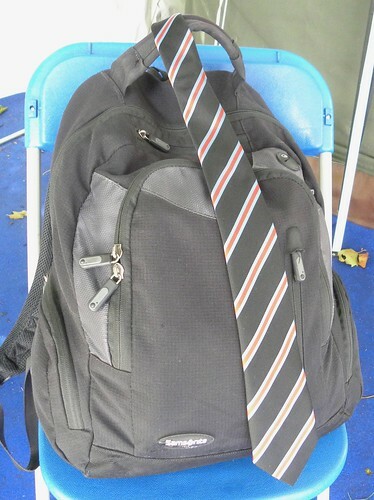 When Theresa arrived, she handed me a school tie from Mr B, to make me blend in a bit. It made all the difference. And the event was much better than the one in my dream in the early hours (the reason for me feeling so sleepy). 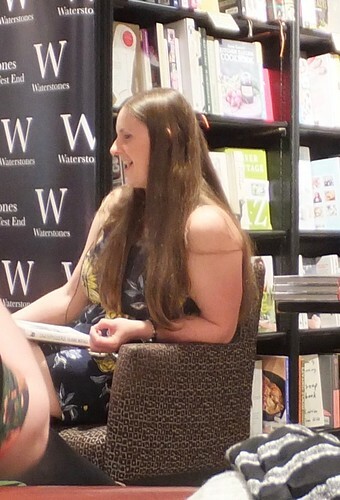 Afterwards Theresa signed for a good hour, which meant I also managed to see Nicola Morgan who was half an hour behind in the signing tent. That’s what I like about these weekday school event days; my authors all over the place. 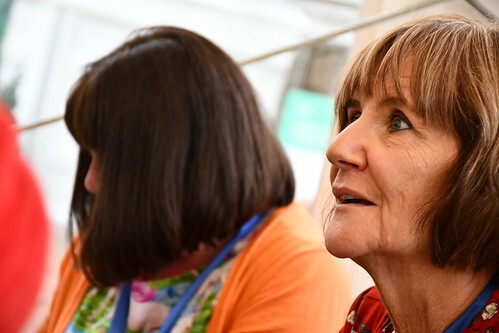 So then I slipped across the square to the children’s bookshop, where I saw Judy Paterson, and Jenny Colgan with Kathryn Ross who had chaired her event. On my way back to the yurt I encountered Cathy MacPhail en route to the Main theatre and there was time for a little hug. 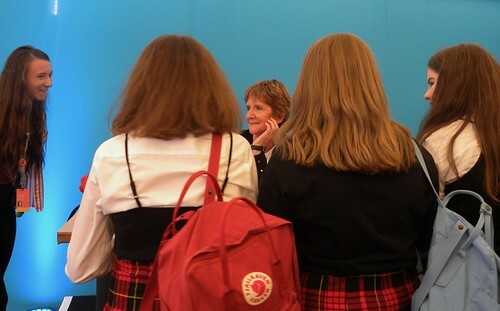 Saw Elizabeth Laird arrive, and then went to sit outside the yurt while waiting for a last photocall. Press boss Frances went off to buy green ice creams for her crew, which they licked in the rising heat, after first taking pictures of her posing with the five cones. 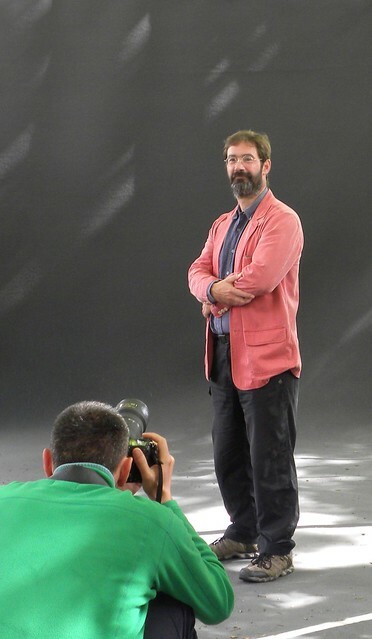 At last it was time for Norwegian crime writer Thomas Enger and James Oswald to face the paparazzi, and me. I think they were both taken aback by the onslaught of so many cameras all at once. Chatted to James while Thomas was being ‘done’ and it sounds as if it’s not something he’s used to encountering. And when it was James’s turn, I mentioned to Thomas that we’d met in Manchester a few years ago. Luckily he remembered who he’d been with, as my memory was fading a bit. I picked up my school tie and half-eaten scone and walked to Waverley in the heat, ‘enjoying’ the piper on the corner, and narrowly missing my train. But there was another one soon enough, and it was both cold and empty, which is the beauty of travelling mid-afternoon and mid-week.